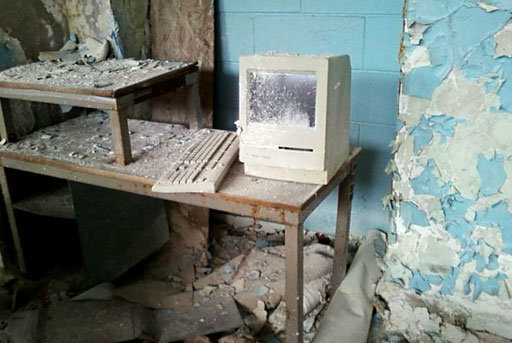 Inspiring photos of what happens to old Macs when the buildings they're in fall to ruins. 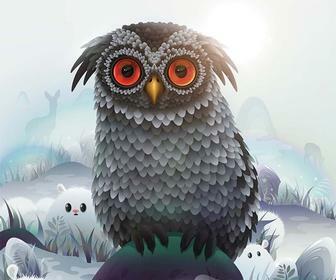 For whatever reasons, humans eventually vacate the places they inhabit, and in doing so, things are left behind. 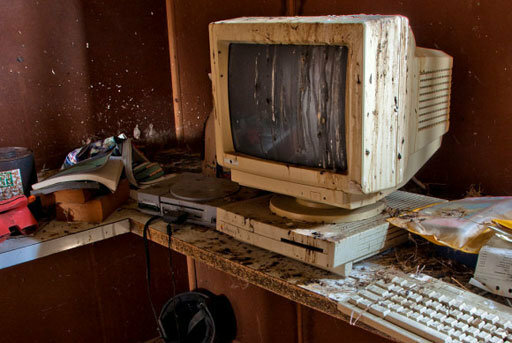 Some of those things happen to be Apple computers, software, and accessories that wallow in dark and dirty places for decades until rediscovered by urban explorers who delight in documenting abandoned urban spaces. Most explorers are guided by a code of ethics not to disturb what they find, as illustrated by their main credo: Take nothing but pictures, leave nothing but footprints. 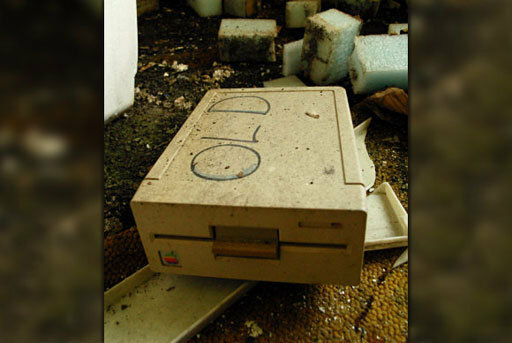 Ahead you’ll see beautiful photographs of abandoned Apple products captured by these latter-day adventurers, who in some cases have risked life and limb to document their finds. [I think this is the point where we're supposed to stress that urban exploration is extremely dangerous and often illegal and ask you to please do not try it yourself – but you're a grown-up, are pefectly aware of this and capable of making your own decisions. 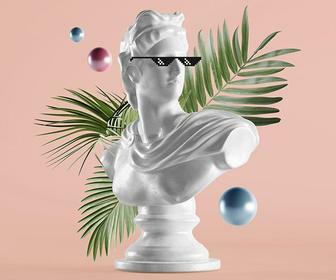 Ed]. Somewhere in Niagara Falls, there stands an abandoned fire station filled with colorful iMacs. 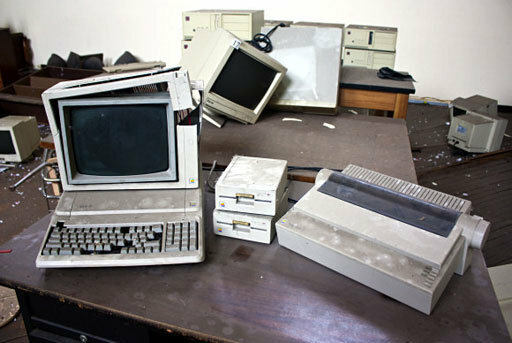 Just a few years ago, these Macs, likely castoffs from some school computer lab, sat wrapped up on shipping palettes when first discovered by urban explorers. Since then, visitors who weren’t as kind have made a point to smash the display of each and every machine. 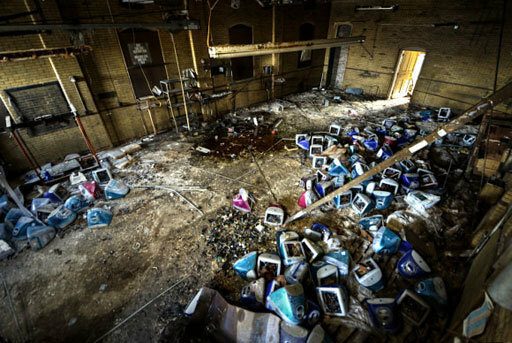 In September 2011, urban explorer Mark the Kid visited a derelict public school in Detroit and discovered dozens of recent vintage MacBooks that had been left abandoned in their charging carts. 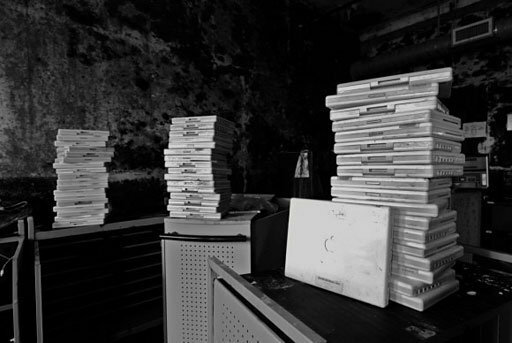 Upon a return visit in December of that year, it appears that someone had moved the notebooks – possibly into the surreal-looking stacks we see here. Photographer Steve Parker recently encountered this scene in an abandoned house in the countryside of Te Akatea, New Zealand. Clearly, birds have taken over the residence where this Macintosh LC III and Sony Playstation reside. Traveler Jared Eberhardt discovered this abandoned Apple IIe among shredded paper at Arne’s Royal Hawaiian Motel in Baker, California. Reports say that all of its rooms have been abandoned to some degree or another, making this establishment the worst motel in the US, the most unique, or both. When the final students and faculty of an abandoned Philadelphia school went home, they forgot to take along this Macintosh Classic. It now sits neglected in the school’s auditorium, covered in decades worth of dusty decay, waiting for another chance to be useful. 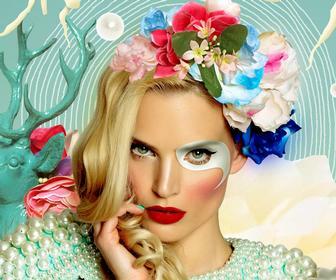 It is unlikely that chance will ever come. In the land before Microsoft Office, there was AppleWorks (1984), an integrated office suite published by Apple for its Apple II series computers. 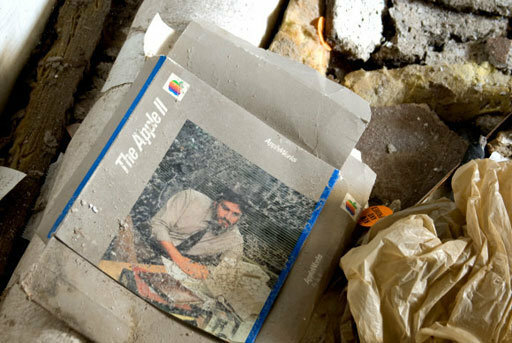 Photographer Chris Luckhardt found a neglected copy of the software sitting among detritus and rubble in an abandoned Rochester, NY office building. Even before humans abandoned this Apple Unidisk 5.25-inch disk drive, someone wrote “OLD” across it, showing it was already thoroughly obsolete when they vacated the premises. So it was very old when Augustus Urbex discovered it in an abandoned Birmingham, Alabama office building in 2012. Makes you wonder if a disk is still inside. 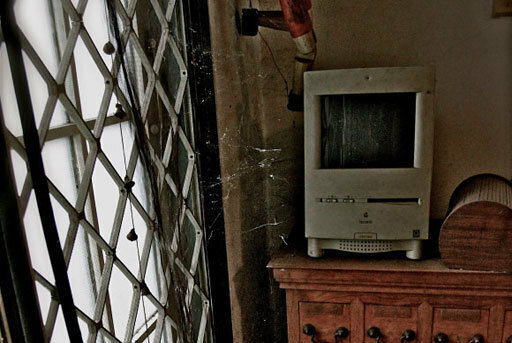 Two Apple fans named Pinot and Dita discovered this Macintosh Color Classic sitting near an accordion in an abandoned house, where it had sat for 13 years. It’s hard not to personify a computer in a scene like this, where the dusty machine seems as if it is “looking at the window, waiting for his master to pick him up,” according to the photographers. 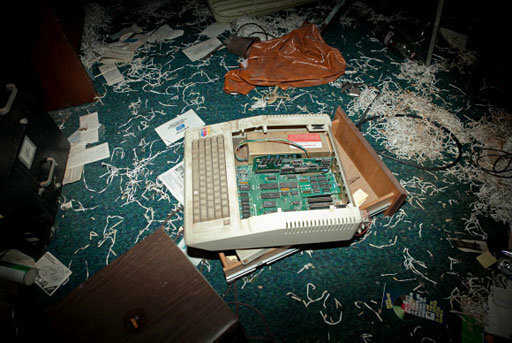 Photographer Ken Fager discovered this vandalized Apple IIe in the computer lab of abandoned Horace Mann High School in Gary, Indiana. Behind it sit stacks of boxlike PC compatibles and various monitors strewn around the space. Curiously, an ImageWriter II, which sits to the right of the IIe, seems to have escaped the cracked fate of its Apple-branded companions. Somebody didn’t want this iMac anymore, and they dumped it under a railroad trestle near Charlottesville, Virginia. 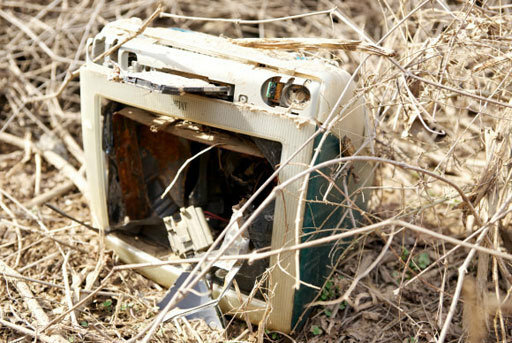 Photographer Karen Blaha happened upon the scene and partially documented the slow-motion reclamation of the iMac by the earth and its photosynthetic helpers, who will eventually swallow it whole. 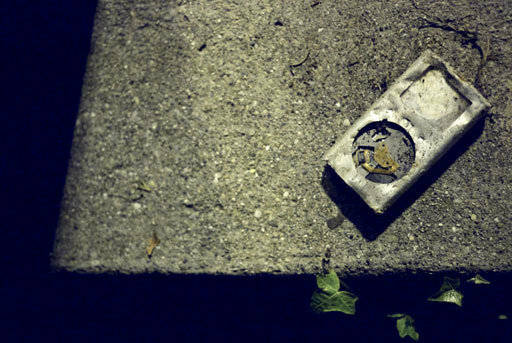 In 2010, Rob Sinclair noticed this partially crushed iPod mini sitting on the concrete at a bus stop in Fribourg, Switzerland. With so many millions of iPods in circulation since 2001, scenes like this are probably common in many urban areas, underscoring the need for comprehensive e-waste recycling programs. Still, many Apple products will doubtless remain misplaced and abandoned, serving as artifacts that inform future civilizations of our nature; others will rejoin the earth, the place from which every manmade item ultimately came.